Launched in California in 1992, Arnette quickly became the eyewear of choice; a lifestyle icon of the 3S generation – surf, skateboard and snowboard. Arnette’s design captivates; encompassing comfort and functionality demanded by action sports enthusiasts. Style, tradition and freedom of expression are the key values underpinning the philosophy of Ray-Ban – for generations the undisputed world leader in sun and prescription eyewear. The brand debuted in 1937 with ‘Aviator’, created especially for American Air Force pilots. Unaffected by the constant change in fashion, Ray-Ban endures – thanks to its absolute quality and authenticity and now more “modern” than ever – worn by countless celebrities and trendsetters worldwide. Launched in 1973 the Vogue eyewear brand adopted the same name as the famous fashion magazine. Vogue styles stand out for innovative design, the wide variety of colours and frames and for the fashionable details on the temple of Vogue glasses; turning everyday glasses into a hot fashion accessory! Vogue Eyewear targets ladies for the most part and is a brand that pays attention to detail; aware of the latest trends. The Vogue Eyewear collection allows one to play with fashion and to create a personalized style. The D&G eyewear collection is characterized by a youthful and innovative spirit; in continual evolution toward new styles and levels of quality. Unmistakably modern detailing makes the new models even more glamorous whilst enhancing its cosmopolitan nature. DKNY is easy-to-wear fashion with an urban mindset – New York City street-smart look. DKNY eyewear caters to modern, urban, fashion-conscious women and men with multifaceted lifestyles: international, eclectic, fun and real. Authentic and timeless, Polo is the foundation of Ralph Lauren menswear, combining the time-honored aesthetic of causal East Coast Ivy League style with English heritage refinement. From ‘preppy’, tailored clothing to vintage sporting classics to chic downtown, Polo’s iconic collections are recognized throughout globally. 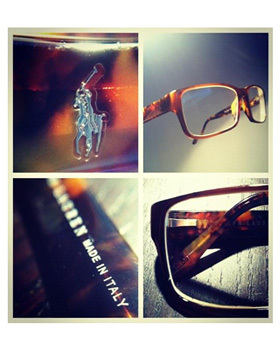 Inspired by the aesthetic of Polo Ralph Lauren clothing, Polo Eyewear captures the same signature sensibility. This collection mixes classically emblematic shapes, such as the aviator, with fresh concepts as in our Big Pony logo in vibrant colors. Total quality, constant innovation without abandoning tradition, searching and selection of materials combined with impeccable manufacturing are the Prada’s product; it is outstanding, not only in terms of high quality, but also innovative style and approach, which always manages to anticipate and influence trends in all sectors. Sophisticated, elegant and refined, Prada Eyewear products are instantly recognizable. Versace is a fashion and lifestyle brand for today’s men and women who love glamour, luxury and a distinctive personal style. Versace’s refined and innovative eyewear design is a celebration of timeless exclusivity and modern elegance. The linear cutting-edge frames represent the ideal of a sophisticated, free and much desired lifestyle. This brand is positioned in the high-end luxury market. The Marc Jacobs eyewear collection, characterized by sophisticated yet fashionably retro shapes, is distinguished by its exclusive and glamorous style. It gives one an impression of discreet understatement but creates a refined image, enhanced by the use of high quality materials and impeccable attention to detail. The products target the ladies, aged between 25 and 45 who want to declare their own identity and personality. This brand encompasses class, refined elegance, attention to detail and overall quality. BOSS products, with a style suited to any situation, reflect a classical inspiration; while the HUGO collection, made from high value and quality materials (titanium and beta-titanium) offers a wide spectrum of unconventional contrasts for the discerning customer. Oxydo eyewear’s target market is people with a refined, original sense of style who stand out in a crowd. Hence the brand’s decidedly fashion/design-oriented approach: trendy details and a distinctive choice of colourways come together in a clean, elegant style. The Tommy Hilfiger eyewear collection embodies the twisted prep lifestyle of the Tommy Hilfiger brand that has become a global symbol of the north-western spirit. The eyewear has been specially designed with a classic yet modern feel that reflects Tommy Hilfiger’s style. Created to be a reflection of a child’s taste and personality, this collection was designed to grow with them and their ever-changing interests. It’s a collection that appeals to kids and parents alike. These are the glasses that you wish you had when you were a kid. There is nothing too precious, too cutesy, or too babyish about db4k. These styles are fun, playful, imaginative, even a little sophisticated. They’re for the cool kids! • If you find it necessary to remove your glasses frequently, wear a neck cord from which they can hang conveniently Never place the glasses face down on a surface; the lenses will become scratched.